Prosecutors in the sentencing trial of Zacarias Moussaoui say he should be executed for his role in the 11 September attacks. But his defence team argue such a move would simply turn him into a martyr. 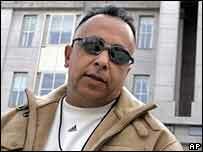 Moussaoui, the only person charged in the US for a direct role in 9/11, has pleaded guilty to conspiracy although he was in jail during the attacks. His sentencing trial began in Virginia on Monday and could last for as long as three months. Prosecutors argue he deserves death for not giving information which may have foiled the 11 September plot. Prosecutor Rob Spencer told the court Moussaoui knew there was a "ticking time bomb in the United States". The defence is seeking to portray him as a would-be terrorist who actually played no significant role. Speaking for the defence, court-appointed lawyer Edward MacMahon called on the jury not to allow Moussaoui to "live on as some smiling face in a recruiting poster for Osama Bin Laden. "Please don't make him a hero. He just doesn't deserve it," he said. If he is spared the death sentence, Moussaoui will spend the rest of his life in prison. The trial could last up to three months and, in an unprecedented step, hundreds of relatives of those killed in the attacks are watching it live by video link from special courtrooms around the country. The 11 September attacks saw teams of hijackers crash two civilian airliners into the World Trade Center in New York and one into the Pentagon, while a fourth plane came down in a field in Pennsylvania as passengers apparently fought back. Roads have been closed and police marksmen deployed around the courthouse, a few kilometres from the Pentagon. The final jury of 18, including six alternate members, was chosen from a pool of more than 80 people just hours before the trial began. "In making this very difficult decision about punishment, you must be guided by reason and your sense of justice and not by bias, prejudice or sympathy for or against the defendant or the victims," Judge Leonie Brinkema told the jurors. The defendant, a 37-year-old Frenchman of Moroccan origin, sat in court in a green jumpsuit and a white cap stroking his long bushy beard as the opening statements were made. Moussaoui, in the words of prosecutor Rob Spencer, "did his part as a loyal al-Qaeda soldier" and "lied so the plot could proceed unimpeded". "With that lie, he caused the deaths of nearly 3,000 people... Had Mr Moussaoui just told the truth, it would all have been different." Moussaoui had been arrested in Minnesota a month before the attacks after arousing suspicion at a flying school. He initially told federal agents he was training as a pilot only for personal enjoyment. Defence lawyer Edward MacMahon said Moussaoui had dreamed of being a terrorist but in reality was "sound and fury signifying nothing". 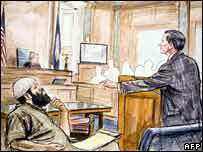 This was not, he told the court, "a substitute for Osama Bin Laden. 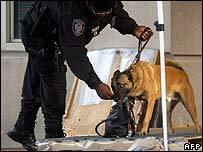 "He should not be made a scapegoat for failures by US government officials in the run up to 9/11," the defence added. Written testimony from six witnesses described by the judge as "enemy combatants" held by the US military will be heard at the trial as sworn verbal testimony. Washington legal analyst Jonathan Shapiro told the BBC there had never been a case like this in American history. "There have never been so many victims, there has never been such an atrocity, there has never been so much emotion surrounding a trial," he added.